Mom looked at me. "When you love . . . whey they die, you want it undone. You'd do anything to have them back, and it's easy to believe that if only this had happened or that had happened, everything would be fine. And that's why makes you angry. What makes you hate. You don't want to believe that sometimes bad things happen just because they do." "If everything matters, then nothing can because it's all the same. And if it's all the same, then nothing is ever special. And shouldn't there be - aren't there - special things? People?" I press my forehead to hers and pretend there are no tubes, no machines, that the skin under mind can feel my touch. It's easy to. I want some part of here to be here. I hadn't realized how much. And even though she's gone, I don't want to let her go. Heartbeat is sad. Like, depressingly sad. But at the same time, incredibly hopeful. We start off by learning that Emma's mother is dead, but being kept alive by machines so her baby may have a chance at life. This is not something Emma supports and resents her stepfather, Dan, for this decision. Once a close family, they have been torn apart by her mother's unexpected death and subsequent status. Soon after her mother's death, Emma's life spirals out of control. Once an AP student with the skills to attend any college she chooses, she is now failing all her classes and shut herself off from everybody except her best friend, Olivia. The great thing about this novel is that you feel Emma's pain, her grief and loss. 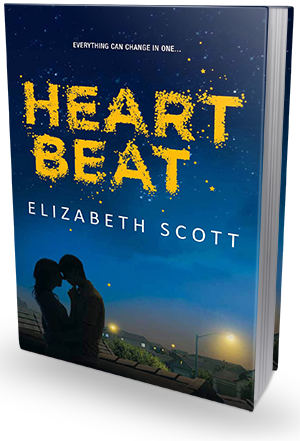 Elizabeth translates the heartache with her words in an emotionally moving way. I suffered along with Emma, I felt lost and confused, the anger at her stepfather and the baby, the wondering why this happened. I can't fault Emma for her anger and confusion. She and Dan are in a tricky situation. Dan believes he did what was right, while Emma can't forgive him for his decision. Is it right to keep her mother "alive" for the baby? Should she be this angry with her stepfather and hold so much hatred for this baby? The novel felt real. Whether Emma was sitting with Olivia, giving sarcastic and hateful comments Dan, or simply thinking, I was able to picture everything that happened. To feel everything that happened. Caleb is an amazing character, crossing paths with Emma exactly when she needed it. He's suffering from his own loss of his younger sister from years ago, a death that both he and his parents blame him for as he was watching her. As they're both suffering from crippling loss, they are able to lean on one another and comfort each other. This relationship gives them both the strength they need to heal and find the peace they need to live their lives. There is a turning point in the novel, a conversation between Emma and her stepfather, that was so wonderfully done, it brought tears to my eyes. I flew through the novel and still felt such a connection to both the story and characters. This would be a hard subject for anybody to read, let alone wright about. Death is hard, the death of a loved one is even harder. Elizabeth handles this tricky topic with class and taste. It's a simple reminder to love the ones we love while we can. Emma talks about how she shouldn't have worried so much about homework and spent just a bit more time with her mother, and while it's easy to say that in hindsight, it's a bit tricky in the moment. This novel is not only a beautiful story, but a beautiful reminder that "grief holds you tight. It holds you forever. But we can hold each other too."